After the tumultuous events of the previous three-parter, I wouldn’t say that the “Citadel” trilogy is a lighter diversion. In fact, it’s tense, suspenseful story about a rescue mission that puts our heroes’ lives in desperate danger, that goes wrong several times, from which not everyone emerges, and which unites Anakin with a man with whom, in the future, he will often work side by side to spread the Galactic Empire’s evil grasp. It is a bit simpler to dissect than the Mortis episodes, however, because it doesn’t have as many layers of symbolism and metaphysics to unpack. In many ways, it’s a much more straightforward adventure, albeit one laced with tragedy and portentousness. In a group of episodes full of resonances with the greater Star Wars saga of which it is a part, no reveal is more of a sucker punch than when we discover that the captain with whom captured Jedi Master, Even Piell (the one from the Jedi Council in Episode I who looked like a similar species to Yoda), split the knowledge of the Nexus Route’s coordinates, is none other than Wilhuff Tarkin, who will later bear the title Grand Moff Tarkin and help oversee the creation and running of the Death Star–the Moff Tarkin of whom Princess Leia will famously say, “Governor Tarkin, I should have expected to find you holding Vader’s leash. I recognized your foul stench when I was brought on board,” moments before he destroys her home planet of Alderaan. One cannot help but sense the thrust of history when Tarkin and Anakin meet for the first time, Tarkin already displaying the cold, cruel personality that will serve him so well under the Emperor. And just as his daughter will indicate many years from now, Anakin, from the start seems to respect Tarkin. 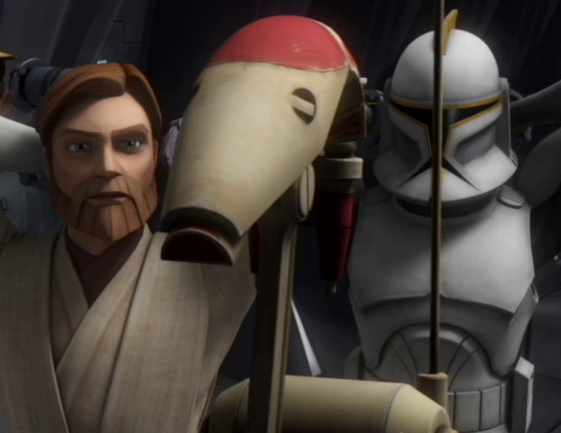 Whereas Obi-Wan and Ahsoka find him abrasive and calculating, Anakin thinks that men like him are just what they need to win the war. When Tarkin tells him that he doesn’t think peacekeepers should be running a war, because their code won’t allow them to go as far as they need to go, Anakin even agrees with him, which makes sense from a character perspective but is also absolutely chilling. At the same time, Tarkin isn’t completely wrong. 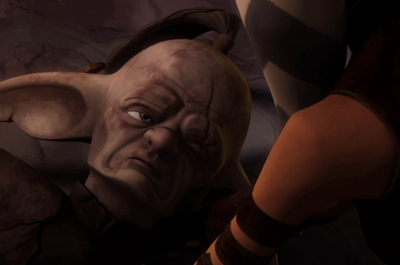 In fact, other people in the past, such as Satine of Mandalore, have argued that the Jedi shouldn’t be waging war, yet their goal was pacifistic in nature, not arguing for the Jedi to be more brutal. And while, yes, heartless people such as Tarkin can more effectively win a war than a Jedi, it can also–as Obi-Wan argues and Anakin doesn’t seem to comprehend–be at the cost of losing the very thing that one should be fighting for in the first place, such as honor and self-respect. And as we know will happen, much more than that. The forging of this alliance is yet another doom-laden puzzle piece falling into place, particularly when we recall how dismissively Tarkin refers to the Jedi in A New Hope. All of these years earlier, he’s the same, dangerous man. Other links to the Star Wars films include the space battle over the planet, during the final rescue mission, the reprogrammed battle droids pretending that the Jedi, etc., are their prisoners in order to sneak throughout the station (how much do I love that Artoo is their commander throughout the mission? ), and the death of Even Piell, which is as powerful and moving as Obi-Wan’s will be in Episode IV. Just as in death, Obi-Wan passes on wisdom to his Padawan, so does Piell bestow wisdom upon Ahsoka. His brief funeral, in which they use the Force to slowly lower him into the river of lava (yet again lava imagery appears, in connection to Anakin) is heartbreakingly beautiful. The other most significant death in this sequence of episodes is Echo, who was promoted to this elite unit the last time we saw him, along with his brother, Fives, making Fives now the last surviving member of the Domino Squad, whose name, in retrospect, proved tragically prophetic. This thread has been one of the most profound on the series to date, hammering home the cost of war whilst personalizing these Clones for the viewers. Echo does heroically, protecting his brothers, just like Hevy and the unofficial sixth member of the Domino Squad, 99, and so, just as with them, his demise is uplifting but also deeply sad. And yet there’s also something darkly comforting about knowing that none of the four fallen Domino Squad members will ever carry out Order 66. And when they return to Coruscant–Ahsoka with half the coordinates, given to her by Piell in his last moments of life, Tarkin with the other half–we continue to see history unfolding in line with its inevitable course. 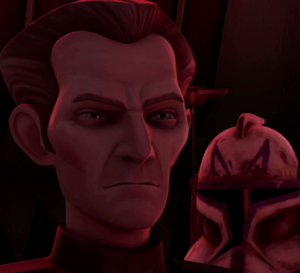 Ahsoka has strict instructions to deliver her information only to the Jedi Council and Tarkin only to Palpatine. The division between the Chancellor and the Council is starting to really make itself known here. Although the Jedi may have never had full faith in him, due to his being a politician, they at first seemed to have a mutually beneficial relationship that was working towards the same goal. Since then, Palpatine continues to make these gradual moves in order to assert his superiority over the Council but in a way that could be construed innocently. But while he still isn’t showing his hand, it certainly does begin to indicate potential trouble in the future. It is this very sort of thing that will begin to truly foster distrust among the Jedi as to what Palpatine’s ultimate plans might be.